A Christmas stocking for the furry member of your family! This cute dog stocking pattern will bring great holiday memories for a lifetime. RED HEART® Super Saver®: 1 skein each 624 Tea Leaf A, 319 Cherry Red B, and 316 Soft White C.
Crochet Hook: 5mm [US Size H-8]. Size: Stocking measures 13½” long. Make some gorgeous little Christmas trees to decorate your home this season! Red heart “Holiday”: 1 Ball each Aran/Gold, Hunter/Gold; 2 balls Wine/Gold. Crochet Hook: 6mm [US J-10]. 3 straight pins with white, green, and red beaded tops. Size: Small Tree is 6½” tall; Medium Tree is 9½”; Large Tree is 13½”. 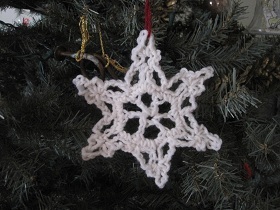 A simple snowflake for the beginner crocheter! Hand made ornaments, especially these lovely snowflakes make a great heirloom for your tree, including years of memories and nostalgia! Just imagine the amount of fun you could have with color! These boots look so cute on little ones, make them in their favorite colors. crochet hook size 6 mm (J) or size needed to obtain the gauge. 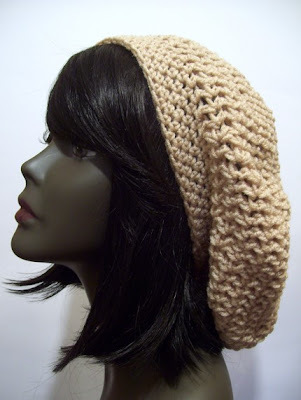 I love this hat style! 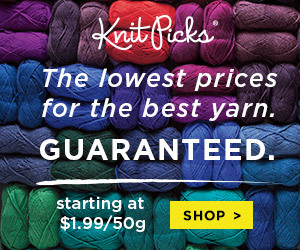 It can be made with so many different yarns and colors! 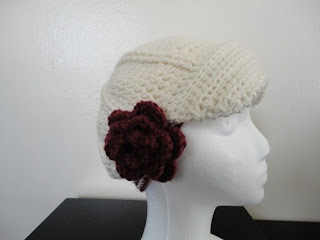 These hats are everywhere; a chic fall/winter accessory! Get ready for the fall season with Bernat Harvest Colors. 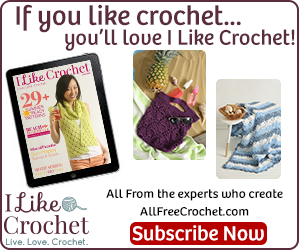 With this free crochet bag pattern you can make a tote perfect for autumn. Bamboo straight handles are used for the perfect addition to this bag. Bernat® Super Value Harvest Colors (197 g / 7 oz)OR Bernat® Worsted Harvest Colors (400 g / 14 oz) 1 ball: (Redwood Heather). Purchased Bamboo straight handles 12 ins [30.5 cm] long. Size: Approx 15 x 12 ins [38 x 30.5 cm]. Blast from the past, a lovely Vintage Pattern! Who doesn't need a lace set of gloves to make you feel like a lady?! J. & P. COATS--/ ball of White or Ecru; 2 balls o/any color. Milward's Steel Crochet Hook No. 11 or 12. This pretty skirt from Garnstudio features a beautiful shell pattern combined with a nice lace drawstring. The prefect accessory for any season! Size: DROPS Crochet skirt in Karisma SuperwashSize: one-size, to fit hip size approx 83cm. I thought this hat was very cute! I am going to make one for myself. I am sure this pattern would be easy to adjust to make smaller or larger. 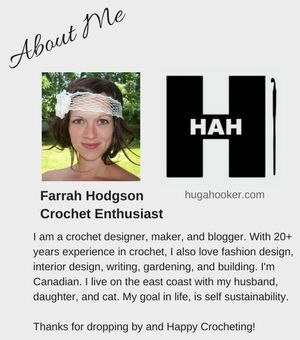 Yarns Required - whatever you have on hand! A great sock pattern, easy to read and easy to make! Keep them all one solid color, or add a fun heel and toe color! 2 - 50g balls of 4 ply knitting worsted. Hook - 4.50. See Charts for conversions. This sock will fit a foot length of 9 to 91/2 inches. 4 sc = 1 inch, 4 rows of sc = 1 inch - This will help you to make adjustments for different sizes. I just keep falling in love with this scarf over and over again! It emits beauty, elegance, and warmth all in one. This is actually three different patterns made by three different people. They go quite nice together. 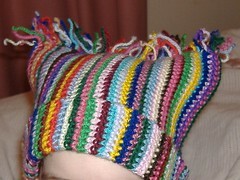 I have posted the ear flap hat previously. It can be made for a preemie, newborn, and 3 months. The mittens in my photos are for an infant, but I also have a pattern for a larger baby I use often. 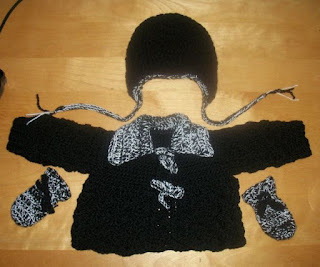 The sweater is called Lil Darlin' baby Sweater by Dot Matthews. 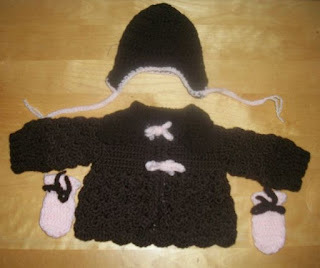 Is it sized 3-6 months, but if you use a smaller crochet hook and baby weight yarn, it can made smaller. This beautiful dress is brought to you from the Garnstudio Team! I love the deep chocolate brown color that they chose for this pattern! This is a great outfit for a cool day. Dark wooden button, no 535: 5 pcs. 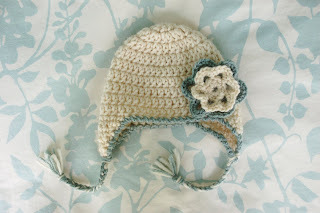 A simple baby hat with ear flaps is always cute on any baby at any given time! These are suitable for little girls and boys, get creative with color and give it a theme. This is a fun VINTAGE PATTERN! I actually made these awesome pants back in 1998, and someone actually stole them from me over the years! Size: Top Measurement at bustline: 30", 33", 36", 39" Pants measurement at hip: 30", 33", 36", 39"
1 - 50g ball of Black 4 ply knitting worsted. 2 - 50g ball of White 4 ply knitting worsted. Crochet Hook - 4.50 mm. 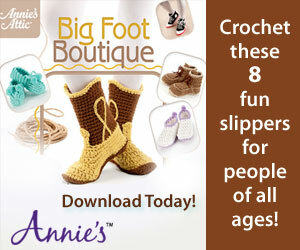 Size: foot length of 9 to 10 inches. Make this timeless classic beauty your own! A flower embellishment finishes off this hat, the possibilities are endless. Here's an awesome pattern for fingerless mittens! Easy and quick to work up, these make a great gift for everyone. A strip of velcro or the hook & loop dots of velcro that look like buttons. Size: Women's medium, or teens. For a larger size, use a 5.50mm (I-9) or 6.00mm (J-10) hook. For a smaller size to fit pre-teens, use a 4.50mm hook. Feel the elegance of soft bamboo by making this exquisite vest! This stylish garment is sure to please.